Anyone worth their filé knows the soul of New Orleans lives within its culture; its music, traditions and, most delectably, food, all combine to create the magnetism that has drawn people from all over the world to the Crescent City since its founding 297 years ago. The joie de vivre doesn’t stop at the city limits, though. There’s a saying, that one should “Be a New Orleanian, wherever you are,” meaning that one should take the joy and zest for life so native to NOLA and bring it everywhere, and to all they do. To some, this may just be a cutesy saying for a bumper sticker. For others, such as New Orleans native and restaurateur Marsha Brown, proprietor of Marsha Brown Restaurant in New Hope, the calling to be an ambassador of “the city that care forgot” is a life’s ambition. As for location, Bucks County stood out as a clear choice. Brown says that from the time she first arrived to Pennsylvania, she was drawn, time and again, to the area for its antiquing, water sports and the beauty of the countryside. “It kept drawing me back,” she says. When the notion to open a NOLA-style bistro first struck her, Brown says she had thought a small 20-seat restaurant would be best to “do what we’re all about: build relationships.” But, while on a visit to one such location, fate intervened and a woman representing a nearby church that had recently come on the market approached Brown and asked her to take a look at the property. “When I walked into the building, I knew,” Brown says. Built in 1874, the old stone church bloomed with details that Brown says spoke to her, “like a calling.” The stained-glass windows, for example, featured fleur de lis. French for “flower of the lily,” this symbol has long been used as the emblem of France and has been flown over Louisiana since the explorer known as La Salle gave the region its name in 1682. 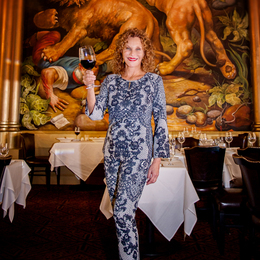 This convergence of spirituality has even been immortalized inside the restaurant in the commissioned mural by artist Valeriy Belenikin titled “Redemption.” Brown herself picked out the imagery, including bible passages and pieces such as the battle of St. George, depicted in the composition. Suffice to say, after seeing all these signs, and others, Brown knew she’d found the perfect place for her restaurant, even if it was a little bigger—by about 150 seats—than she’d initially envisioned. Now, Marsha Brown Restaurant is celebrating its 13th year in business, and it has grown to become not only a New Hope hotspot for Creole cuisine but also an elegant destination for weddings. General manager Wendy Kelly leads the restaurant’s team during such affairs and is therefore well versed in all that goes into making someone’s event memorable. At its heart, though, Marsha Brown Restaurant is all about the food. This is fitting, of course, as Brown, who has been cooking gumbo and jambalaya since she was a young girl, brought her family’s tried-and-true recipes right into the restaurant’s kitchen. One of the dishes demonstrating this training is the eggplant Ophelia, which features layers of eggplant, crabmeat and shrimp accented by Creole butter sauce. Brown emphasizes that food isn’t just sustenance for the body; it’s also a means of drawing family and friends together to share love, thereby making it a means of feeding the soul as well.